The island of Madagascar (also known as the Malagasy Republic) lies in the Indian Ocean, roughly 500-1000 Km from the east coast of the African continent. The island measures over 1500 Km from south to north, the southernmost tip corresponding in latitude to Bundaberg ( Queensland) and the northernmost point to Cairns. The climate is influenced by the flow of warm ocean currents and the eastern and northern coastal regions are hot and humid. Orchids found in these regions require warm conditions of cultivation. However, a mountain range with peaks over 2500 m high extends from one end of the island to the other, and the orchids found there can be grown under intermediate or even cool conditions. The eastern slopes of the mountain range are much wetter than the western slopes and most Madagascan epiphytic orchids are to be found in the east. Madagascar is particularly rich in orchids, many of them unique to the island. By far the most popular among hobby growers are the angraecoids, a generic term that covers members of the sub-tribes Angraecinae and Aerangidinae (the third sub-tribe of the tribe Vandeae is Sarcanthinae, which includes vandas, phalaenopsis etc.). 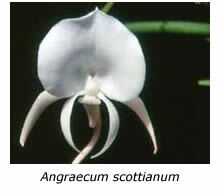 The most commonly grown angraecoid genera are Angraecum, Aeranthes, Jumellea, Aerangis, Cyrtorchis and Rangaeris. Most species have attractive white, green or occasionally yellow flowers, which bear a characteristic spur containing nectar at its tip. In general, those Madagascan orchids found at altitudes between sea level and 900 m require warm conditions of cultivation (18-35°C), those found between 900 m and 1800 m require intermediate conditions (12-30°C) and those found above 1800 m can be grown with little or no heat in winter in Melbourne, although they need to be kept cool in summer. Some angraecoid orchids that occasionally appear on our show benches are listed below, together with the conditions for culture that Fred Hillerman recommended in A Culture Manual for Angraecoid Orchid Growers (1992). Warm growers : Angraecum arachnites, A. eburneum, A. comorense, A. leonis, A. scottianum, A. sesquipedale and its hybrid Angraecum Veitchii (A. sesquipedale X A. eburneum), Aeranthes arachnites, A. grandiflora, and A. ramosa. Despite Hillerman’s recommendations, I successfully grow Angraecum comorense, A. scottianum, Aeranthes ramosa and Angraecum Veitchii in my glasshouse, which I maintain at temperatures between 12°C and 30°C by heating in winter and cooling in summer. 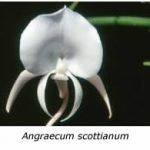 Intermediate Growers : Angraecum arachnites, A. compactum, A. magdalenae, Aeranthes henrici, Aerangis articulata, A. citrata, A. rhodosticta and A. fastuosa, Cyrtorchis arcuata, Jumellea gracilipes, J. fragrans, Oeoniella polystachya and Rangaeris amaniensis. Cool Growers : Angraecum compactum, A. magdalenae and Jumellea gracilipes. Of course, not all Madagascan orchids are angraecoids. 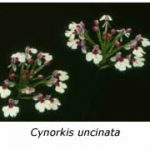 But the only non-angraecoids that I can recall on our show benches are one or two species of Cymbidiella, two Cynorkis species and Grammangis ellisii. The genus Cymbidiella, so named because of its resemblance to Cymbidium, is unique to Madagascar. 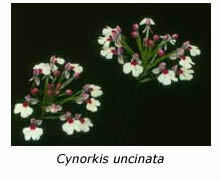 There are three species, the most well known being Cymbidiella rhodochila, which, as the name implies, has a red lip. Other flower parts are green, the petals being covered with black spots; intermediate conditions are said to suit it best. 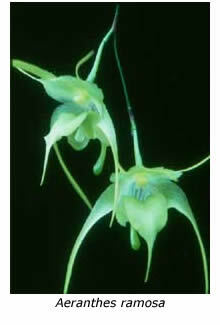 Cynorkis is a large genus of terrestrial orchids, with over 100 species in Madagascar and a further 20 in Africa. Plants of Cynorkis fastigiata often germinate in the pots of other plants grown in heated glasshouses. Mature plants are self-pollinating and readily set seed, which germinates easily under warm, humid conditions. Cynorkis uncinata has much larger, more colorful flowers and is a far more rewarding species to grow, although it is still uncommon at present. Grammangis ellisii has attractive, glossy gold and chestnut flowers but is rare in local collections. 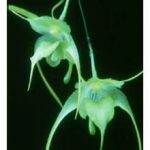 The angraecoid orchids are certainly far easier to acquire and I recommend that you try a few, especially if you can provide them with a minimum temperature of 12°C in winter.